In the 1990s, Dr. James Harris of BYU, along with Dann Hoane, succeeded in establishing the algorithm for the oldest alphabetical system yet discovered. The team brilliantly assigned sound values based on the pre-Thamudic (early Hebrew and Aramaic) dialects instead of sounds used in Arabic dialects. The results, called "proto-Canaanite." were dramatic. The controversy regarding prot-Canaanite was exactly when it was invented. 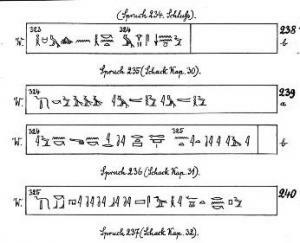 While Harris seems to suggest that certain characters were derived from Egyptian hyeroglyphics, the following discovery seems to illustrate that the language existed prior to the Egyptian era. ScienceDaily (Jan. 30, 2007) -- The first public revelation of the earliest continuous Semitic text ever deciphered has taken place at the Hebrew University of Jerusalem. The presentation was made by Prof. Richard Steiner, professor of Semitic languages and literature at Yeshiva University in New York, in a lecture entitled "Proto-Canaanite Spells in the Pyramid Texts: a First Look at the History of Hebrew in the Third Millennium B.C.E." The lecture was sponsored by the Academy of the Hebrew Language in cooperation with the Hebrew University and the World Union of Jewish Studies. Prof. Steiner, a past fellow of the Institute for Advanced Studies at the Hebrew University and a member of the Academy of the Hebrew Language, has deciphered a number of Semitic texts in various Egyptian scripts over the past 25 years. In his Hebrew University lecture, he provided the interpretation for Semitic passages in Egyptian texts that were discovered more than a century ago, inscribed on the subterranean walls of the pyramid of King Unas at Saqqara in Egypt. The pyramid dates from the 24th century B.C.E., but Egyptologists agree that the texts are older. The dates proposed for them range from the 25th to the 30th centuries B.C.E. No continuous Semitic texts from this period have ever been deciphered before. The passages, serpent spells written in hieroglyphic characters, had puzzled scholars who tried to read them as if they were ordinary Egyptian texts. In August, 2002, Prof. Steiner received an email message from Robert Ritner, professor of Egyptology at the University of Chicago, asking whether any of them could be Semitic. "I immediately recognized the Semitic words for 'mother snake,'" said Steiner. "Later it became clear that the surrounding spells, composed in Egyptian rather than Semitic, also speak of the mother snake, and that the Egyptian and Semitic texts elucidate each other." Although written in Egyptian characters, the texts turned out to be composed in the Semitic language spoken by the Canaanites in the third millennium B.C.E., a very archaic form of the languages later known as Phoenician and Hebrew. The Canaanite priests of the ancient city of Byblos, in present-day Lebanon, provided these texts to the kings of Egypt. The port city of Byblos was of vital importance for the ancient Egyptians. It was from there that they imported timber for construction and resin for mummification. The new discovery shows that they also imported magical spells to protect royal mummies against poisonous snakes that were thought to understand Canaanite. Although the Egyptians viewed their culture as far superior to that of their neighbors, their morbid fear of snakes made them open to the borrowing of Semitic magic. "This finding should be of great interest to cultural historians," said Prof. Steiner. "Linguists, too, will be interested in these texts. They show that Proto-Canaanite, the common ancestor of Phoenician, Moabite, Ammonite and Hebrew, existed already in the third millennium B.C.E as a language distinct from Aramaic, Ugaritic and the other Semitic languages. And they provide the first direct evidence for the pronunciation of Egyptian in this early period." The texts will also be important to biblical scholars, since they shed light on several rare words in the Bible, he said. "This is a sensational discovery," said Moshe Bar-Asher, Bialik Professor of Hebrew Language at the Hebrew University and president of the Academy of the Hebrew Language. "It is the earliest attestation of a Semitic language, in general, and Proto-Canaanite, in particular."